Hey friends and future friends! 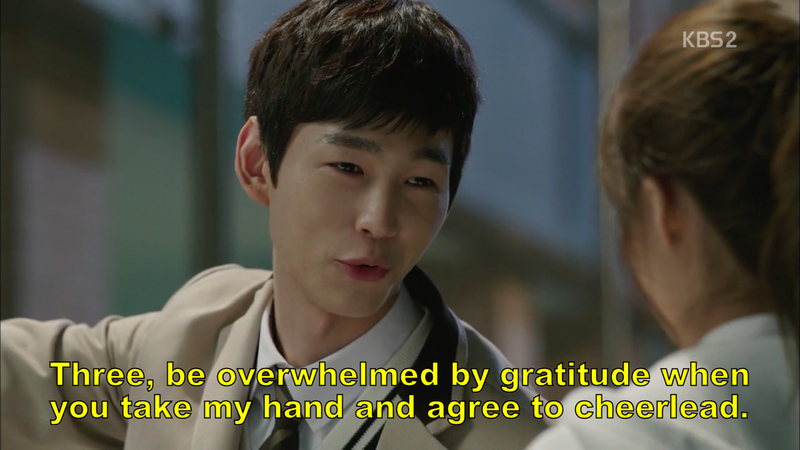 How is life in dramaland treating you? I don't think I was the only one who devoured the latest episode of Cheer Up! as soon as it aired. This is definitely not a drama to be missed from what we're seeing so far. Let's talk about what we saw in episode 3. When we left off Yeol approached Yeon Doo and asked her to join the cheerleading team with him. Of course she thinks it's ridiculous because he knows how much she hates Soo Ah and he was the one who revealed how Soo Ah was manipulating the whole situation. So as we'd expect Yeon Doo says no. Although, if I was her I'd want to hear him out. Shouldn't she at least be curious as to why he changed his mind? Later, as she's hanging out with the remaining two members of Real King, Soo Ah approaches with the two members who left Real King to join the cheerleading squad. They look guilty as Soo Ah boasts to Yeon Doo. 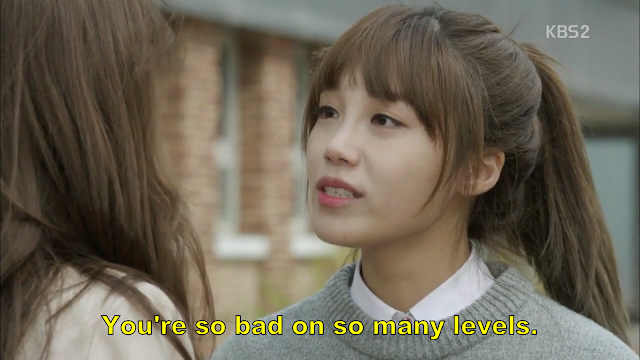 But Yeon Doo and her friends scoff at Soo Ah's pettiness and leave. I think if her friends that left knew Yeon Doo was going to find out eventually, shouldn't they have had the balls to tell her first? 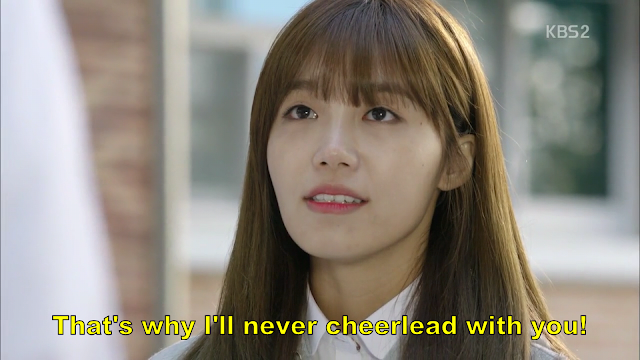 I mean, if they really joined the cheerleading club for reasons that couldn't be helped and felt guilty about it, shouldn't they have at least tried to explain to Yeon Doo? It's not like she's unreasonable to her friends; she's actually quite loyal to them. Yeol sees the entire interaction between Soo Ah and Real King. He smiles at the way Yeon Doo handles herself quite well, but can tell something is up with the former members of Real Kings. So Yeol approaches Soo Ah and asks how she got the members to join and she tells him they came to her. He finds out that they faced the choice of either joining Baek Ho, the cheerleading club, or getting kicked out of the dorms. Yeol tries again to convince Yeon Doo to join cheerleading, but she won't even talk to him so he devises a plan. As the teacher is giving out punishments for those who went over 15 penalty points for the week, Yeol reveals all of the rules he broke, which earns him enough points for a penalty. Then he rats out Yeon Doo for leaving the campus without permission. The result is that they both have to serve their penalty together, crushing milk cartons. Yeon Doo is unmoved, but Yeol says he will convince her by the time they are finished with their task. He ends up asking her friend from Real King to meet him. The friend doesn't know Yeon Doo is there and when he shows up, his suitcase is packed and it's revealed that he too got threatened but still decided not to join Real King. Yeol is shocked to see that Yeon Doo already knew her friends were getting kicked out. Yeon Doo breaks down and reveals her struggle. It kills her to see her friends struggling, but at the same time her pride is all she has and she'd rather die than help Soo Ah. It's kind of shocking to see Yeon Doo choose her pride over her friends at this point, but it adds complexity to her character. I don't think this makes her selfish. After all, her friends all made their choices too, but I think it's a realistic look at the fact that it's not always easy to make a decision that requires you to sacrifice something really important to you. Yeol stands there with her and lets her cry, but he lets her cry for a little too long and they end up having to bolt back to the dorms only to find out that they've already been locked. Ha Joon throws down a rope for them to climb up with. Yeol offers her his hand if she'll agree to join the cheerleading club, but she says no. He goes up and she tries calling her roommates for help, but no such luck. Yeol repels back down just like Rapunzel and offers her his hand with no conditions this time. They get into Yeol's room just as the monitor is approaching. Dong Jae, who shares the room with Yeol and Ha Joon, stalls the monitor so that Yeon Doo and Yeol can get inside. The two of them lay under the covers in Yeol's bed and Ha Joon tells the monitor that Yeol is sick. Meanwhile, Yeon Doo is laying there beneath the blanket essentially attached to Yeol's side. These two keep finding themselves in these close positions and I am not complaining one bit. Yeon Doo rushes back to her dorm and makes it their just in time for bed check. Yeol texts her and asks her to meet him in the laundry room. He tries to appeal to her on a more emotional level this time. He says he's going to try lying to convince her and then tells her that he needs to do cheerleading to save her friend. She seems to know that he isn't actually lying. He tells her that it seems like pride is the most important thing to her, but it's not to him, but that it's her choice whether she joins. We can see that this shakes her. He kind of puts it into perspective for her that she's chosen pride over her friends and is it really more important? So Yeon Doo calls out all the members of Real King to meet with her. They can't hide how happy they are to be together again. Yeon Doo chastises them for not telling her that they were getting threatened and they express sympathy for not telling her and making the choices that they did. They all agree that they miss Real King and she tells them that they are going to get Real King back. It's so nice to see them all together again. They're at their best when they're together. So the next day they go to the principal and tell her that they'll agree to do the dance competition, but not before calling the princpal out on her manipulative ways. They also make her promise to reinstate Real King if they win. She agrees and Yeon Doo gets it on recording so she can't go back on her word. The principal says they must also present letters of apology which they expected in advance and already prepared. After they leave the principal sees that the letters of apology are all about how they will succeed in the future and she smiles as she reads them. It would seem that even the she-devil that is the principal can't help having a little respect for these ambitious kids. Yeol finds Yeon Doo in the hall and expresses his gratitude for changing her mind. She shares with him that she wants to keep her friends together and of course he has to give her that crazy charming smile that he does.We see a mob of the angry mothers of the other Baek Ho students show up. They have found out about the cheerleading competition being instilled to help Soo Ah get into college and are furious their children are being used. They confront the principal and make it clear that they mean business, but haven't yet taken the mater to the board. 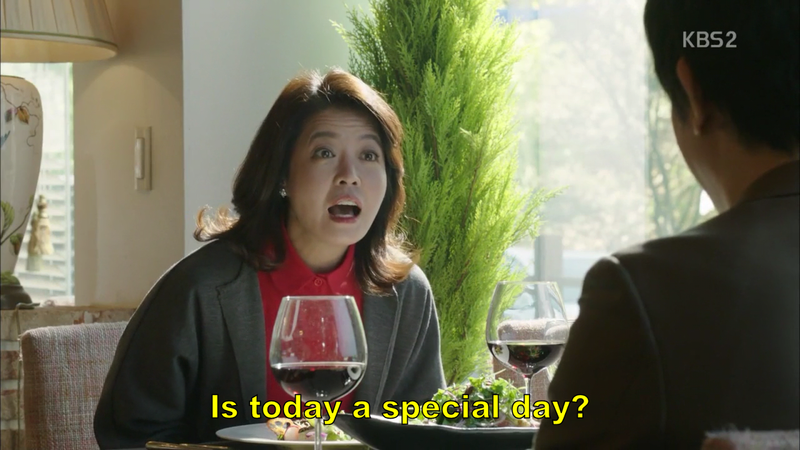 Meanwhile Yeol's father and Yeon Doo's mother are having a meal together at a restaurant. He has a box in his pocket and motions over a server with a cake. It looks like he almost certainly is going to propose. At this point I'm going No, no, no! This is bad! Yeol and Yeon Doo can't be siblings that will ruin everything. I seriously will not be able to handle it if that happens. But thankfully the angry mothers of Baek Ho enter for a meeting with Soo Ah's mom and this prompts Yeol's dad to decide that he and Yeon Doo's mom need to leave. This makes me curious. Is he leaving because he's embarrassed to be seen with Yeon Doo's mom or is he leaving because he just absolutely hates the horrible petty moms of the Baek Ho students. This is an important distinction in his character and I hope it's revealed soon. The mothers of the Baek Ho students agree not to go to the board about the fraud of participating in the cheerleading tournament just to get Soo Ah into college as long as her mother agrees to slant it so that it benefits all of Baek Ho and not just Soo Ah. And so Soo Ah's mom agrees. What choice does she have really? After all, she's willing to do pretty much anything to get Soo Ah into an ivy-league college. How much longer before that includes murder? This woman is on a slippery slope. Back at Sevit, a cheerleading coach that Soo Ah's mom hired arrives to help whip the group into shape. She announces that the member of Real King will be the main ones cheering while the members of Baek Ho will essentially be holding pom-poms to look pretty. Real King is furious that they are being used even more than they originally thought and want to quit, but really have no choice. Yeol feels as though he should do something to help Yeon Doo and to make sure that they both get equal credit and have to do equal the work. Ha Joon has been noticing Yeol's interest in Yeon Doo and can't help but mention it to Yeol at this point. Yeol responds that he doesn't really know what's going on, but he just keeps ending up intertwined with her. We see Soo Ah sneak outside where she has a secret pack of cigarettes. Dong Jae sees her retrieving the cigarettes and tries to bring her one that she dropped, but she lies and says it isn't hers. Yeol sees this and asks Dong Jae for the cigarette. I swear Yeol is like a ninja. He overhears and sees everything. Anyway, Yeol brings the cigarette to Soo Ah with a smirk and puts it in her bag. He entices Soo Ah to make the cheerleading competition fair, but she isn't remotely interested. So once they go back to class and the teacher is about to release them, Yeol announces that he's missing his wallet, so the teacher has no choice but to go through everyone's bag. As he gets closer and closer to Soo Ah's bag, she starts to freak out. 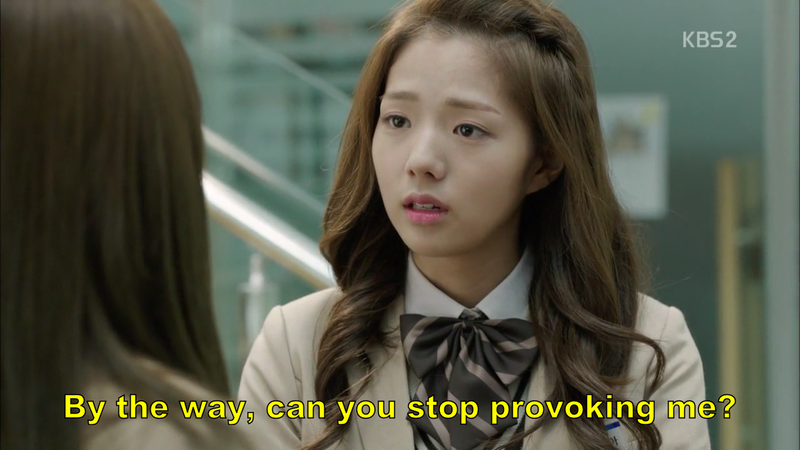 Yeol is attempting to manipulate Soo Ah into changing her mind just like she's manipulated everyone else. Yeon Doo realizes what's going on and announces that Yeol has found his wallet. Afterward, Yeol questions why Yeon Doo didn't let him go with his plan and she explains that she doesn't want to sink to that level. Soo Ah overhears this and comes up and slaps Yeon Doo, accusing her of playing dirty and threatening that she can play just as dirty. The fact that Soo Ah doesn't think she's been playing dirty so far is crazy to me? If what she's done is fair play, I don't want to see what her dirty looks like. Yeol defends Yeon Doo saying it was all his idea and Dong Jae sees Yeon Doo getting slapped and comes to check on her, but all this makes Soo Ah angrier at the fact that Yeon Doo has people on her side. Soo Ah leaves and we then see a flashback to Yeon Doo taking away her cigarettes and giving her candy, saying they're bad for her. Yeon Doo encouraged her when she was feeling bad about getting second place and even though Yeon Doo's mom was scolding her about getting 196th place, Soo Ah envied their interaction because Yeon Doo's mom clearly loved her and had warmth for her. Soo Ah's own mom calls her out to remind her that making mistakes has put and kept her in second place. During cheerleading practice, the coach runs them through drills. Real King is able to complete the physical activity without much difficult, but Baek Ho struggles greatly. After practice Soo Ah asks Yeon Doo why she saved her in the classroom and Yeon Doo responds that she knew the cigarette was a painful memory and Soo Ah scoffs at her. Yeon Doo expresses that through everything she still feels sorry for Soo Ah which infuriates Soo Ah. Soo Ah doesn't think that she's in the position where anyone should pity her and therefore takes it as an insult. This girl is straight up crazy. Even when people help you, you still want to go after them. In fact, even more so. She tells Yeon Doo she's going to go after what's most important to her. Later, Yeol overhears Soo Ah giving two guys a cheat sheet to study off of in exchange for them doing her a favor. We then see the same two guys approach Dong Jae on the basketball court getting closer and closer. Yeon Doo watches on concerned when Soo Ah arrives, pretty much admitting that it's her doing and expressing curiosity as to why Dong Jae nervously about getting touched. We know he has a phobia of being touched so when the one guy grabs onto him, he collapses completely. As Yeon Doo is seeing to Dong Jae, Yeol confronts Soo Ah. She spouts off some nonsense about Yeon Doo being the one to try to rat her out with the cigarettes, but Yeol calls her b.s. and tells her it should be him she's after, not Yeon Doo. He asks her why she's so bent on bringing Yeon Doo down, but she only replies that Yeon Doo was the one to start it. Yeon Doo sees that Dong Jae is okay after going to the nurses and they walk out together. They cross paths with Soo Ah and Yeon Doo is seething while Soo Ah doesn't acknowledge them. After Soo Ahh passes, Yeon Doo grabs a basketball and throws it at Soo Ah's head. I'd say she's definitely had enough of Soo Ah. She calls So Ah dirty and tells her that even if she was going to be horrible she should at least live like a human. The next cheerleading practice is just as strenuous and the members or Baek Ho give up. They tell the coach that they are not going to do cheerleading and the coach tells them to get out. They call their parents who storm the school to confront the cheerleading coach. They threaten to fire her when she tells them she'll quit. These parents are so crazy ridiculous. Do they really expect their kids to win a cheerleading competition without cheering. But then who should show up? Someone has called the education board and they have shown up to investigate the school and the possibility that the principal and the parents are conspiring to make the club look real just to get the students into college. And that's where our episode ends. Can't wait for the next chapter in this story tonight. In the meantime catch up on my take of this show so far on the Main page below. Have fun and drama on, friends!